Philosophy Adventure: Pre-Socratics walks homeschool students through lessons on members of the School of Athens, exploring their beliefs, background, and works from a biblical worldview, while also learning how to write skillfully, think critically, and speak articulately. Chapters focus on Thales, Pythagoras, Xenophanes, Heraclitus, Parmedides, Empedocles, Protagoras, and Democritus. The Philosopher's Story: anecdotes from his life, the time/place he lived, and main accomplishments and beliefs. Write, Think and Speak assignments complement the concepts presented. Geographical information pertaining to the life of the Philosopher. Contrast section (2 parts): the first part presents students with actual source material or a secondary source if no primary work survived, and the second part explores whether his ideas align with a biblical worldview. Clear instructions are provided so students can work independently. The first half of the textbook contains all the lessons to read; the back part contains writing checklists with forms for peer evaluation and critique along with freewriting assignments and lists of recommended resources and the index. The workbook features worksheets, map activities, freewriting assignments, "write/think/speak" journal with 30-minute timed assignments, writing checklists, and glossary chart with room for students to fill in definitions. This course (if supplemented with math, science, and foreign language) can be used as a complete unit study or as a supplemental program. If used as a supplement, this course can be completed over the course of a year at a pace of one lesson per month, over the course of a semester at one lesson every two weeks for 16 weeks, or over a quarter/8 weeks. High School grades. ESV Scripture used. Student Text, 125 pages, softcover spiralbound with CD for single-family use. Student Workbook, 142 pages, consumable and non-reproducible, spiralbound softcover. 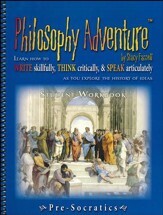 This workbook is part of the Philosophy Adventure course, and is ideal for multiple students in the same class, or younger siblings whose family already owns the student textbook sold in the text & workbook kit (sold-separately). This workbook features worksheets, map activities, freewriting assignments, "write/think/speak" journal with 30-minute timed assignments, writing checklists, and glossary chart with room for students to fill in definitions. It cannot be used apart from the Philosophy Adventure Text. 142 pages, consumable and non-reproducible, spiralbound softcover. High School grades. ESV Scripture used. 5) Retain what you've memorized by reciting all memorized verses at the start of each week. You can test this using the recitation charts found in the journal at the end of each chapter. 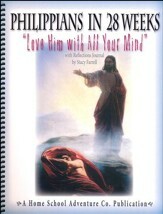 This painless approach uses cardstock memory cards (perforated and pre-printed with each week's verses), space to write out copywork verses, journal reflection questions, weekly reflections, recitation charts, and an optional tracking log to help you not only memorize, but dig deeper into the book. 132 pages, reproducible for in-family use, spiralbound softcover. ESV Scripture used.